Why is everyone upset about the surplus of fighting in this year’s NHL playoffs? Goon is a word being thrown around a lot. I guess sticking up for your teammates and playing a physical style of hockey warrants the ‘goon’ label. Yes, some of the happenings have been cheap, here’s to you Shea Webber, but overall the scraps, scrums, fights and line brawls have been warranted. Some of the fights have been the result of good, clean hard hits during the flow of the game. TV ratings are up and the arenas are packed, two tell tale signs that people enjoy this sort of thing. When two guys drop the gloves or when five guys drop the gloves for that matter, everyone in the arena cheers as the ice turns into Wrestle Mania. They love it and I love it. And really, who has been hurt in these melees? Ottawa Senator Daniel Alfredsson did miss last night’s Game Three against New York, so for the most part, the so-called ‘goonery’ has not resulted in an injury. In Sunday’s Game Three between Pittsburgh and Philadelphia, seemingly after every whistle there was a push, a shove and a scrum. Sidney Crosby, one of the most hated players in the entire league was in the middle of it all game. From knocking Jakub Voracek’s glove away as he skated to pick it up, fighting Claude Giroux and then preventing Scott Hartnell from going after James Neal. Crosby has been labeled a ‘cry-baby’ and a ‘whiner’ by fans across North America and even by New York Rangers head coach John Tortorella. That branding might have to go now. Sidney Crosby earned something Sunday. He earned more respect from his teammates, his fans and the hockey world. 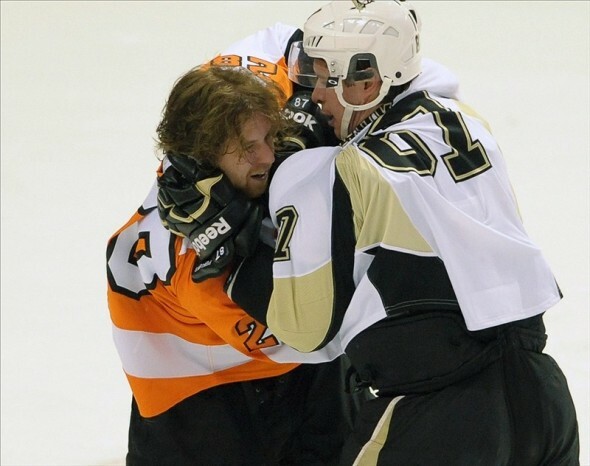 For as much as he is criticized, dropping the gloves for a teammate is the sign of a true hockey player. Crosby moved up a few notches in my book over the weekend. Fighting has its place in hockey. It can intimidate, it can swing momentum in your favor and most of all, the fans love it. These playoffs have only confirmed that as every action has a reaction and it is magnified now. If you come after me, I am going to come after you, that is the mentality and that is what makes this time of year so exciting. Hockey is the only North American sport in which players consistently and openly talk about their dislike for other players and teams. In the NBA, NFL and MLB the players serve as talking heads, always praising their opponents. After Pittsburgh lost in Philadelphia, Crosby said he does not like a single player on the Flyers. In any other sport, it would serve as the so-called ‘bulletin board material’, in the NHL Crosby’s face has been up on Philadelphia’s bulletin board since October, that is what makes hockey great.